For the last couple of days, I featured wonderfully ornate and elaborate Harry Potter rides at Universal Studios. And while the rides are fun, they weren’t my favorite. 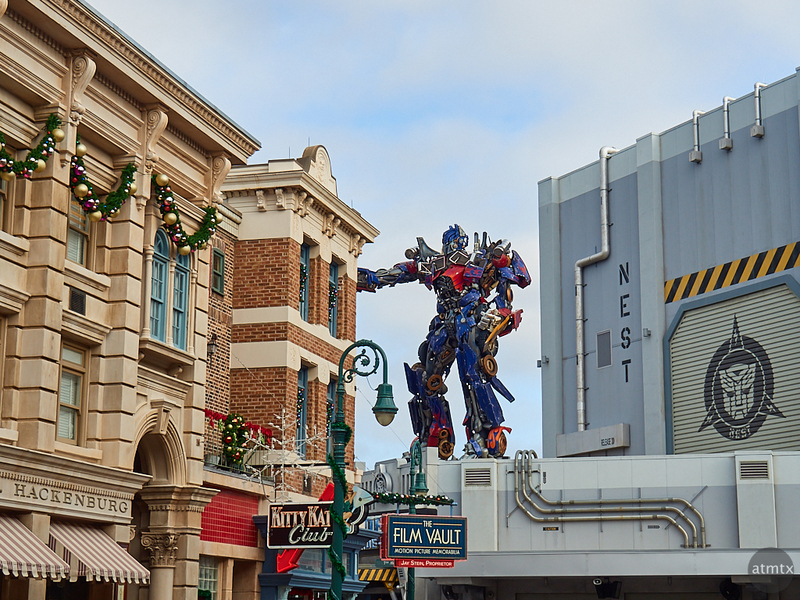 While the Transformers The Ride – 3D, is not nearly as fancy, I think the motion ride was more seamless, giving a better illusion of being on the streets with the giant autobots. The motion ride projections of the Harry Potter characters never looked real enough for me. They clearly looked like video screens complete with visible pixels. Perhaps, in some future incarnation, the resolution of the screens will increase to a level of seamlessness. I’m sure the transformers ride uses a similar technology, be because the main actors are computer generated, they seem to blend in better with the physical, simulated streetscape. Michael Bay’s Transformer movies have always been a manic ride with each iteration of the franchise getting increasingly frenetic. I’m exhausted watching them with my brain exploding from visual overload. There’s an excellent YouTube Channel called “Every Frame a Painting”, and this video decomposes all the tricks Michael Bay uses to create his over the top style. Called “What is Bayhem?”, it’s a fun watch and actually educational for photographers. Imagine an actual, physical moving ride, in 3D, with a bit of Bayhem thrown in. That’s what the Transforms ride is like. Except, instead of being hours long, like a movie, it’s an enjoyable and intense 4 1/2 minutes. The photo above juxtaposes the ride with the simulated old New York set, at Universal Studios. Always fun to mix two imaginary worlds, shot with the Olympus 14-150mm lens on the Olympus OM-D E-M5 Mark II.